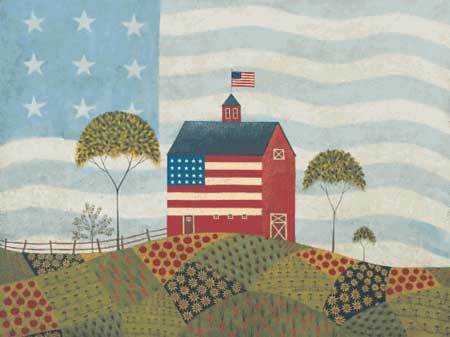 A folk-art farm with an American flag painted on the side of a red barn. There is also an American flag flying from the barn steeple. The sky is an American flag in shades of light blue and white. There are a few trees along a rail fence line, and in front of the barn is a crazy quilt of different crops, pumpkins, sunflowers, carrots, beets, and flowers.